Even if you have never encountered a stuffed squash blossom you can tell just by looking at one that it is meant to be filled with something a bit decadent. Like bright deflated balloons that just happened to float into the garden, these bulbous blooms are an incredible bonus to an already exceedingly useful plant, the Cucurbita pepo. Whether the typical green courgette/zucchini commonly grown here in the UK, or the slender saffron curves of the crookneck squash of my Florida youth, all varieties of summer squash produce these golden edible sacs. The usual stuffing is ricotta, and I see no reason to deviate. The delicacy of this fragile flower invites smooth mild fillings and I can think of nothing more suitable than this creamy Italian soft cheese. As for subtle but stand-out flavours, I was inspired by the citrus-sour buckler leaf sorrel/sheep’s sorrel growing happily after a sudden ‘haircut’ earlier in the month (for its own good), as well as the ever-present lemon mint and spearmint lining the path to the hen house (sadly defunct). Lemon zest provided the third citrus tang to lift the ricotta. Back home, with waistbands to consider, baking is the way to go. Believe me, it is no compromise to bake rather than fry as both ways with squash blossoms are more-ishly crispy and good. Especially with Prosecco. That is three times I have mentioned booze in this post. Does someone need a holiday?? squash blossoms nibbles + a preview of my upcoming Colombian Avocado Soup! Well yes, don’t mind if I do. Actually, I am sending this post to you from Dubrovnik. As you read this, the Food To Glow family are currently eating our collective body weights in fish and various delicacies I have no hope of being able to pronounce. There may even be wine. For information on how to pick, select, store and use squash blossoms, Gardening Know How has some tips for you. I should have read this earlier as I had left my kindly-given blossoms (thank you Kathy and Warwick) languishing too long before using. Don’t do this; I had to throw out quite a few. Pick and eat on the same day if possible. Over to you! What healthy summer nibbles have you been cooking up? Leave a comment and share your ideas and recipe links. Baked, not fried, is the key to getting healthy, crunchy squash blossom bites. The herby add-ins are up to you, but my sorrel and mint are great just now and work so well together – zesty and fresh. Gluten-free? Try crushed almonds or other nuts. 1. Preheat the oven to 180C/350F. Line a baking tray with foil or parchment and lightly coat with oil or use oil spray. Set aside. 2. Stir together the stuffing ingredients, seasoning to taste after mixing. Spoon this into either a small piping bag or – as I did – into a small plastic sandwich bag with a corner cut off. 3. To stuff the blossoms, take one flower and carefully make a vertical slit from the base – about 1 ½ inches long. Reach in and tweak off the stamen. Now take the bag of herbed ricotta and squish in some filling, twisting the flower at the end to hold it in. 4. Dip the blossom in the egg and then into the panko, covering well. Place on the lined and oiled tray. Eat immediately. Lovely as a pre-dinner nibble with drinks and olives. Plus loads more in my Index. Yum! I love that they’re not only delicious, they’re beautiful! Now I’m craving this! 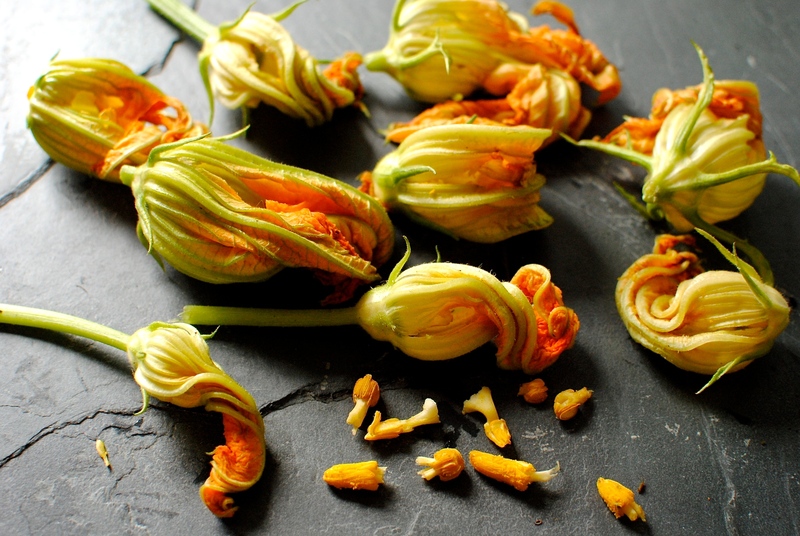 Such a shame that I find it so hard to buy squash blossoms…maybe I should start growing! I’m growing them next year. Currently I get my blossoms from two very kind neighbours, but now that I no longer have chickens I can grow things that they would otherwise help themselves to. I’ve grown them in the past and they really are such easy, “plug and play” vegetables. I hope you give them a go, too. Surely dairy causes cancer. Do you not work for cancer prevention. I am confused. Like a lot of things that may contribute to development of cancer, any risk with dairy is what is called dose-response related. A lot *may* contribute to cancer for some people. I follow the advice of the esteemed American Institute for Cancer Research and the World Cancer Research Fund, and the large and robust studies they analyse don’t have dairy as a general risk factor for any cancer but advanced prostate cancer (because of the excess calcium, not IGF-1). It is a good idea to limit dairy, as well as meat, sugar, salt and some carbohydrates. But small amounts in a balanced plant-centred diet are thought by the majority of cancer researchers and health professionals to be of benefit. I always offer vegan alternatives in applicable recipes as some follow a vegan diet for a variety of reasons. I hope you find these alternatives acceptable and tasty. 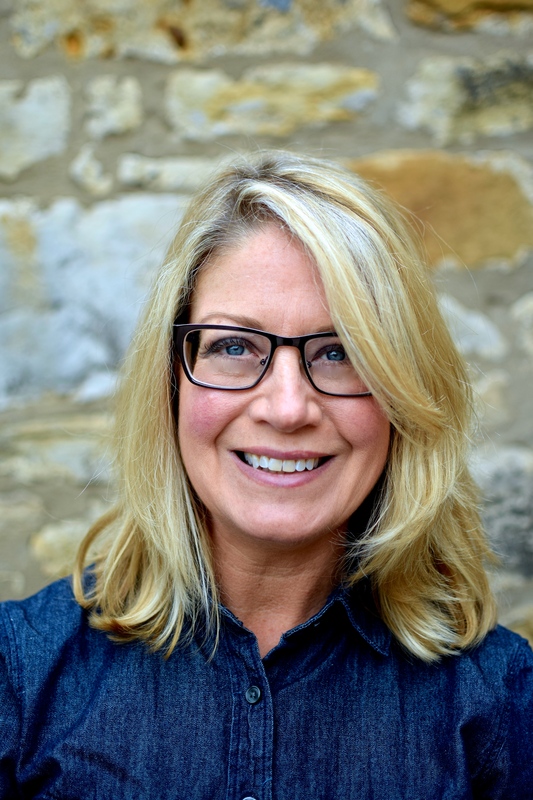 Professor Jane Plant is of the view that dairy causes reproductive cancers. Totally gobsmacked… with the recipe and the images. Just wow! And you’ll see that it is really easy too! No risk of burning yourself in hot fat either. 😉 Thanks for stopping by. My snack for today! Healthy too! So beautifully presented too, dear Kellie! I also love that tofu ricotta! 🙂 MMMMMM! I have never made squash blossoms at home but this looks pretty easy to do, and I love the nut coating suggestion especially. I bet a savory cashew filling could work well too. This summer I’ve been enjoying cobblers, summer squash soup (recipe forthcoming), some light summer curries and plenty of grain salads highlighting sweet and savory with melons or stone fruit. What has been your garden favorites this year? Enjoy your holiday Kellie! Oh yes, a trusted cashew cheese filling rather than tofu-nooch would be fabulous, Katie. I haven’t done any cobblers while it has been hot but come early autumn my family will get sick of me cobblerising everything! We have had some nice soupy light curries (I love making pho too) and grain salads but I will stop by and see you your ideas and thoughts. My garden faves are still chard and kale, with tangy buckler leaf sorrel and close second. I will just nibble it off the plant as I pass. Thanks for commenting and leaving some ideas for other readers. 🙂 PS I will look forward to seeing what you do with your squash soup. I do a walnut,lemon thyme and squash soup but with such a lot of squash around it is always good to see new ways to go with them. I’ll probably never make this but boy, this sounds (and looks!) absolutely mouth-watering! Thank you for the verbal thumbs’ up. I like your ‘name’. Very cool. And with that I’m off to raid my mother’s garden for squash blossoms! Gorgeous recipe! I love the idea of using the panko crust and baking them – the deep fryer scares me. Absolutely stunning. I love beautiful food like this. And you have created such a lovely table scene. I must go to the market this weekend and see if squash blossoms are available. Thanks! The daisies were picked for the kitchen windowsill but I stole a couple for the pix. I hope you find some blossoms at the market and give these a go. They are super-duper easy and mega-crunchy. ;-)) You wouldn’t be able to resist. And why should you?? Your recipes are just amazing!! This looks mouthwatering! This looks amazing, it is a great idea to bake them and I loved the recipe. Here in Mexico we cook with squash blossoms all the time. I love them in empanadas with cheese, and with poblano peppers, shrimp, corn and a touch of cream. Thank you for sharing! Oh yum – empanadas! Do you have a recipe, Bettina? That sounds so, so good! Such an enchanting recipe that not only screams summer but is a testament to the possibility of lightening up a recipe without any loss of flavor. Just fabulous! I love a challenge, me. 🙂 And I really don’t think they lose a thing – except loads of fat. Cheers for stopping by, Deb. 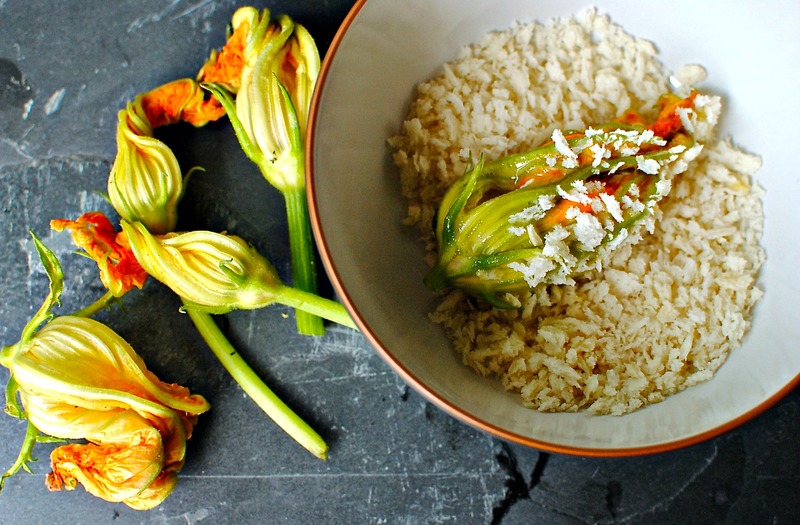 We call these zucchini flowers but I love that you call them squash blossoms! What a fabulous name and one I’m adopting from now on. This looks like such a delicious recipe. Thanks for sharing it. I have always wanted to try making these but have been put off by the deep frying – the idea of baking them instead is inspired. Thanks for the idea and your lovely recipe and photos! In the UK we call them courgettes too. Marrows are giant courgettes to us, although I understand they are actually different plants to most people. I am an American ex-pat so most of the time I give both words but I think of the yellow ones as squash (which are less common here) and the green ones as courgettes. I hope your winter weather has been kind to you. Thanks for your comment. I hope you get to try them this baked way once spring comes for you. Thank you, Marie! I’ll admit the photos have got a little better, but still very amateurish. Which I don’t mind 🙂 Cheers for taking the time not only to stop by but to leave such a lovely comment. Can I ask who sent you, Marie? Beautiful photos! Can you believe that I have never used pankro before. I really should, as there is so much I was to try. Thanks Urvashi. The soup recipe is coming soon. I just want to tweak it a little more. I grew my zucchini plant this year. however due to a lot of rain the leaves started to grow mold i had to get rid of it. Those look amazing. I’ll have to make them next season. Poor you! After careful nurturing I do get attached to my plants, and doubtless you feel similarly. I hope you can have something that will grow happily over the winter months and not have to wait until spring to enjoy edible gardening. I’m more of a soda water/club soda fan when it comes to bubbly batter mixes, but in the UK it is common to get beer batter fish. I know that’s not on your menu, but maybe a kind of nori-flecked beer batter tempeh perhaps? Sounds a bit wacky typing it, but I’m a bit tempted to try it! Still in Dubrovnik where it is unusually/crazily stormy. I understand it is quite benign back in Scotland. Typical! I have been experimenting with similar type of recipes recently but mine are not half as goof as yours. Looks fab. Good, goof, too much food. Wowzer. These are STUNNING. I need to grow squash just so I can make these and impress my friends. I really really really need to try them. Food perfection. Those look so lovely, I’ve always wanted to try these or courgette flowers but never managed to find any – and I’m not a gardener! I love stuffed courgette flowers but never see them down here in London very often. Always reminds me of holiday eating in Italy. Love you pics. I guess maybe there isn’t the demand for them, or the window of availability is quite small. I can’t say I have actually looked up here in Edinburgh as I have neighbours who give them to me and I know others who grow their own too. In London there is perhaps less space and shadier gardens to give these a go more widely. Still, their rarity makes them even more special when you can find them. And there is always Italy…. Beautiful beautiful photos! Looks like such a delicious and unique dish! blogging on holiday- wow, I think I may get told off for that! But I think I had this post in my drafts I would be looking forward to sharing it too! How beautiful your photos are here! Not only are squash blossoms lovely to behold, but lovely to eat and lovely for what they can do for your body: loads of calcium and iron and especially high in vitamins C and A. Not bad for such a yummy treat. The panko is a great idea by the way! Reblogged this on Fit Gurl Go. ahh…panko of course…how clever…will try this with my next bloom. I made these last night and my family loved them. I’ve been frying them all summer and needed an alternative. They really hit the spot. Thanks! I made these today with homemade cashew cheese, egg replacer (to appease the vegan hubby) and breadcrumbs from seed bread – Delicious! Thanks for the inspiration. Thanks for posting this recipe. My wife and I used it last night to make a variation with ichimi togarashi instead of herbs, and mozzarella instead of ricotta in our akehime and kurinishiki blossoms. We dipped them in a little shoyu after baking. This baking method is waaaay better than the fried versions.